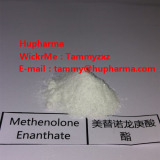 Methenolone Enanthate Primobolan injectable Anabolic Steroids Powder Buy Methenolone Enanthate Powder, Raw Methenolone Enanthate Anabolic steroid powder, China Methenolone Enanthate Steroid Powder, steroids,oral steroids,injectable steroids,Steroid Cycles,anabolic steroids for sale online Product Name: Methenolone Enanthate CAS: 303-42-4 Purity: 99% Molecular Formula: C27h42o3 Molecular Weight: 414.62 Appearance: White or off-white crystalline powder Description: Methenolone Enanthate is the injectable version of methenolone with a long ester attached to slow absorption of a the active methenolone compound and provide steady blood concentrations. The oral version of this compound is practically identical with the difference being the attached ether (the oral version has a shorter acetate ester attached). Both versions of methenolone are good choices for cutting cycles for men and/or women and have shown to maintain muscle while on a low-calorie diet. Methenolone Enanthate provides a less frequent administration mode for methenolone and anecdotally appears to require a lower overall dose in order to be as effective as the oral acetate version. Applications : Primobolan Depot (methonolone enanthate) is often of interest to beginning steroid users and sometimes to experienced users. The first question to consider is really not pharmacological but one of economics. Usually for any given level of effect, Primobolan is an unusually expensive choice. And for most users, there is no unique benefit gained from its use. Accordingly, most experienced steroid users do not include it in their steroid cycle planning. Primobolan is an expensive steroid; this is the main reason it is not as popular as one would initially think. It is widely available on the black market. The original Primobolan Depot from Organ is mostly found as a 1ml ampule with 100mg strength.You may favour methenolone enanthate over methenolone acetate primarily for its ability to deliver 100% of the base steroid methenolone through an injection. When taking the oral methenolone acetate you can expect 40-50% of the steroid to break down as it passes through the liver.